Topology and its Applications is primarily concerned with publishing original research papers of moderate length. However, a limited number of carefully selected survey or expository papers are also included. 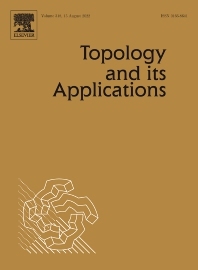 The mathematical focus of the journal is that suggested by the title: Research in Topology. It is felt that it is inadvisable to attempt a definitive description of topology as understood for this journal. Certainly the subject includes the algebraic, general, geometric, and set-theoretic facets of topology as well as areas of interactions between topology and other mathematical disciplines, e.g. topological algebra, topological dynamics, functional analysis, category theory. Since the roles of various aspects of topology continue to change, the non-specific delineation of topics serves to reflect the current state of research in topology. At regular intervals, the journal publishes a section entitled Open Problems in Topology, edited by J. van Mill and G.M. Reed. This is a status report on the 1100 problems listed in the book of the same name published by North-Holland in 1990, edited by van Mill and Reed.